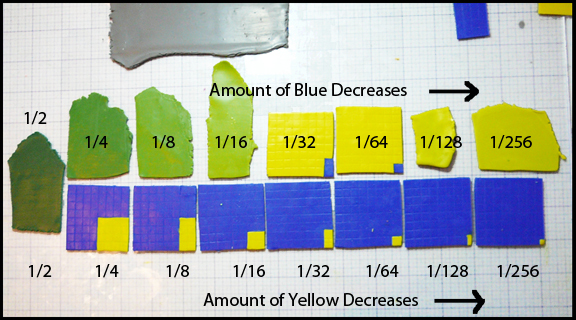 People have been asking me how I made the strips I used in earlier posts to illustrate the effects the proposed elimination of two Premo primaries (cobalt blue and zinc yellow) would have on color mixing. Actually, my students had made them in a cooperative group effort a couple of months earlier and I just borrowed them for the illustration (left). The students and I had been exploring the same principles addressed in the exercise “Mixing Color Scales” in Maggie and Lindly’s book “Polymer Clay Color Inspirations”. (I did this exercise in my very first polymer clay class, taught by Maggie and Lindly.) In this case, however, we used a different method to measure out the clay. Each student picked a different pair of Premo primaries. They rolled the clay into sheets of a uniform thickness, keeping the colors separated. Next, they used rubber stamps I had made for this activity to stamp out an equal number of squares of each color. The 2″ x 2″ stamps were marked with a grid of 64 squares. The last section of the grid was subdivided into even smaller sections. 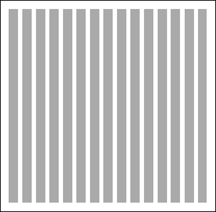 I had the students line the stamped squares in rows: one color above and the other below. After doing this a few times I realized it was helpful to leave a space between the two rows as shown in the diagram below. This made it easier to keep track of 1/2 and 1/2 point. The students then switched sections of the squares back and forth between the colors to produce a series comprised of different proportions of the two colors (above). Figure A. 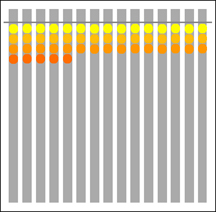 Starting from the 1/2 and 1/2 mixture (left) the blue (bottom) was replaced with decreasing amounts of yellow and the yellow (top) was replaced with decreasing amounts of blue. After the series was complete, the combinations were mixed to produce a gradient of colors from one primary to the other. I had the students cut uniform strips of gray clay and lay them out side-by-side on a tile. The number of strips was equal to the number of participating students. Diagram of raw clay strips aligned on tile. Starting at one end of the gradient, the students punched out dots of each color and pressed them onto the strips starting with one pure primary and ending with the other. 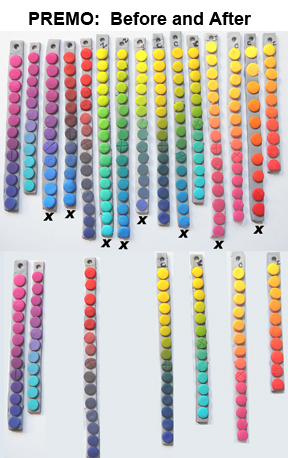 The colored dot representing the 1/2 and 1/2 mixture was marked with an x (where the black dot is on the image to the right) to identify it. (In Maggie’s version of the exercise the 1/2 and 1/2 circle is larger than the others.) The tiles with strips on them were fired and the students traded strips until everyone had a strip representing each color combination. The back sides of the strips were labeled with the names of the two primaries used in the mixtures. The strips were punched at the top end, allowing them to be threaded onto a key chain. 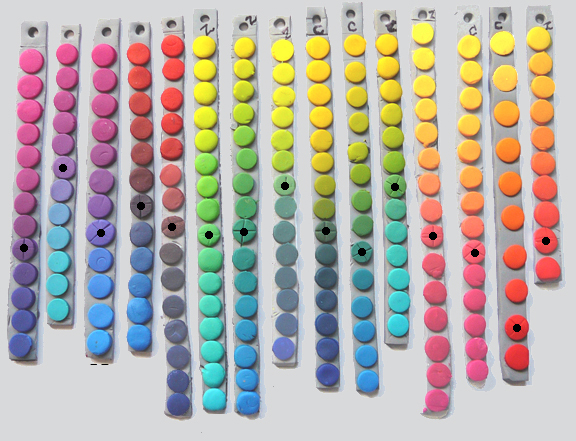 I called the results “color keys” because they were similar to keys on a key chain and could be carried in one’s pocket. Also, they were “keys” to mixing different colors. The color “recipes” can be read starting from the 1/2 and 1/2 mixture, just by remembering the pattern used to mix them (Figure A). (The “minor” color decreases by half with each step towards the ends.) Get together with a group of friends and do this – you’ll wind up with more than 100 color recipes you can carry in your pocket! This entry was posted in Classes/Workshops, Color, Teaching and tagged Carol Simmons, Color, Color Mixing, Kaleidoscope Canes, polymer clay, Polymer Clay Classes, Polymer Clay Colorado, Polymer Clay Teachers, Polymer Clay Techniques, Polymer Clay Workshops. Bookmark the permalink. Love it! Do you have any of those little stamps for sale? I probably have a few I can bring. Hello! I’m sorry if i double post, but I do not see my comment here. I am a newcomer to polymer clay but I am completely addicted already! I really love your work, it is breathtaking and almost unreal. I love the botanical influence in your creations. I would love to play around with colour scales, and I wonder if you perhaps have the original vector graphic that was used to create the little grid stamp? That way I could get someone local here in Sweden to make one for me. Thank you Sophia. I haven’t found the graphic but I’ll keep looking. You can also put the clay on a printed grid such as gridded paper and use the lines on the grid to position your blade. Carol, this reminds me of Elise Winters grid, still sold at Polymer Clay Express. I would love to buy your stamp and make the color keys …. I love your canes. I’m in America and just learned of you. All your classes are full. Do you have a book or have you considered doing an online class?